Travel plans this spring? As for me, I’m finally headed to Hong Kong so travel is very much on my mind. Preparing for any trip requires a lot of coordination, to ease the stress of a long drive or flight, there are certain travel essentials that you can pack to help make the journey more comfortable. A quick search on the internet will yield a ton of travel packing lists, but it never hurts to look at more than one to make sure you didn’t forget anything! So without further ado, here are my travel essentials. Whether you’re road tripping, flying, or tackling the highest roller coaster at your favorite amusement park, peppermint oil is one of the most useful travel essentials to pack. It offers quick relief for a number of ailments including headaches, travel breath (just dab a smidge on the tip of your nose. Peppermint is so strong, it gives you the fresh-brushed scent), lack of energy, and nausea. I often use it to relieve nausea caused by motion sickness by wafting the bottle under my nose for a few seconds. The best thing is that most essential oil bottles are small enough to bring on your carry on, or throw in your purse without taking up a lot of space, or adding extra weight. Peppermint oil is a true travel essential. Lavender essential oil is a great way to ease the stress of travel. Dab a bit on the inside of your wrists (mix with a carrier oil), and let the stress just melt away. I’m sure these were already on your list anyway. Just make sure to take the chargeable kind, as there was a recent news story of a woman’s battery-powered headphones exploding. I always like to bring my own small travel-size blanket. It’s not only great for the plane or in the car to keep warm and cozy, but also in the hotel. I usually like to wrap my travel blanket around me to protect myself from any kind hotel bedding germs. It may not actually protect me, but it gives me a little extra warmth, comfort, piece of home, and peace of mind. You always need wet wipes! I use them to wipe the plastic areas on my plane seat. I also love the LA Fresh wipes, which come in everything from anti-bacterial wipes, to deodorant wipes, and makeup remover wipes. You can order those on Amazon. It’s always nice to have a few baggies or Ziplocs on hand. They’re great for holding trash that you might accumulate throughout your travels. They can also be used for a sudden emergency, like throwing up (I’m that person you don’t want to sit next to on the plane). 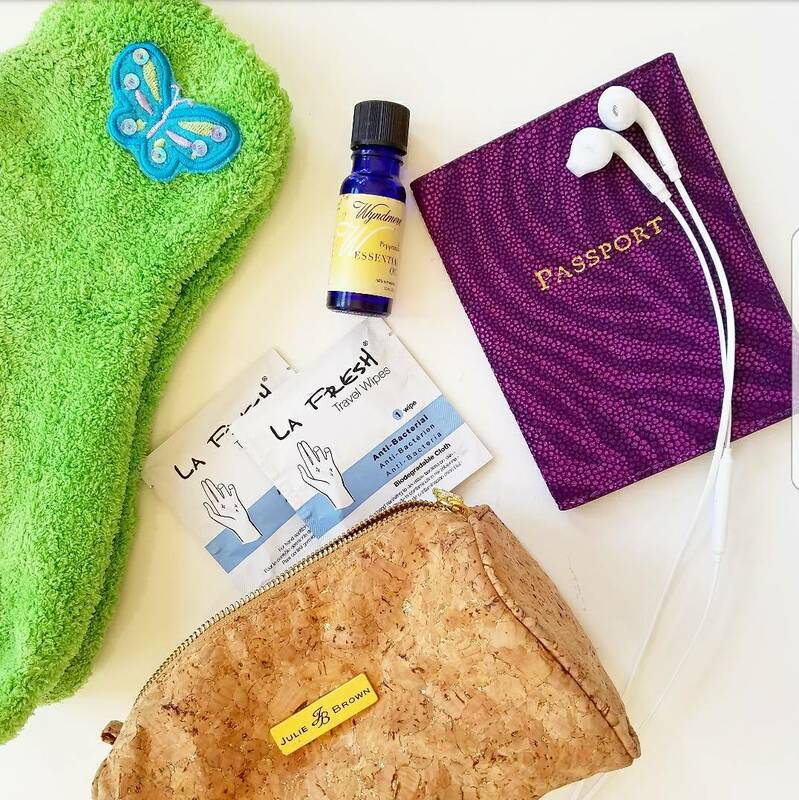 When I’m riding as a passenger, or flying, I like to bring a pair of fuzzy socks or more comfortable slippers (they make a certain kind of plane/hotel/house slipper that’s not too conspicuous) to wear for overseas flights. If flying, I like to bring ear plugs that reduce the air pressure during lift off and landing. Gum also helps your ears to pop if you don’t want to spend $7 for a pair of earplugs. For some, flights can cause severe headaches, an effect I experienced after flying with a cold and feeling like my head was going to explode. Air pressure plugs can have issues of their own, make sure you get ones that fit the ear canal, use them for take offs and landings. travel-size aspirin, toothbrush, toothpaste, and deodorant.